The deep ocean is awe-inspiring: vast, mysterious, and complex… I can find many adjectives to describe it, yet the immensity of it prevents me from picturing it in my mind. Landscapes are easy to imagine because we see them all the time, but their hidden ocean counterparts of seascapes with several kilometer-high seamounts and abyssal trenches are hard to visualize. When I started a PhD on the spatial ecology of humpback whales, a species typically known for its coastal distributions, I never imagined my research would lead me to seamounts. Lesson of the day: you never know where research will lead you… So here is how it happened. About twenty years ago when my supervisor, Dr Claire Garrigue, started working on humpback whales in New Caledonia, she was told by fishermen that humpbacks were often observed in prime fishing locations, about 170 km south of the mainland. 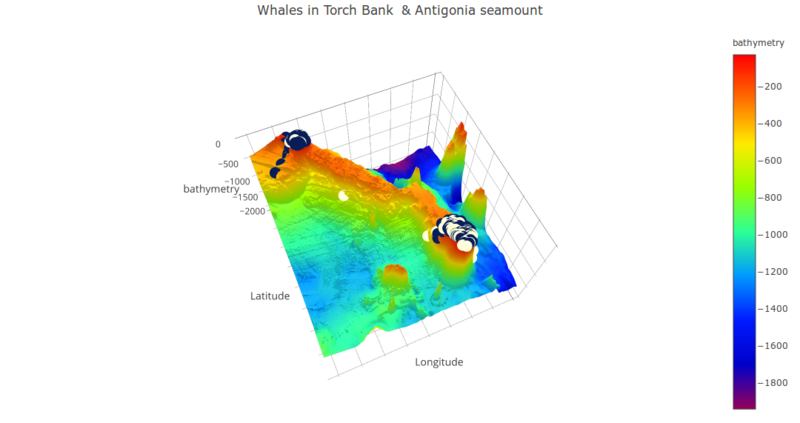 After a little more investigation into this claim, it was discovered that these fishing spots corresponded with two seafloor topographic features: the Antigonia seamount and Torch Bank (Fig. 1), These features rise from the seafloor to depths of 30 m and 60 m respectively and are surrounded by waters about 1500 m deep. This led Dr. Garrigue to implement an ARGOS-satellite tagging program to follow the movements of humpbacks leaving the South Lagoon (one of the main breeding area in New Caledonia, Fig. 1). Sure enough, most of the tagged whales (61%) visited the Antigonia seamount (Fig. 2; Garrigue et al. 2015)⁠. 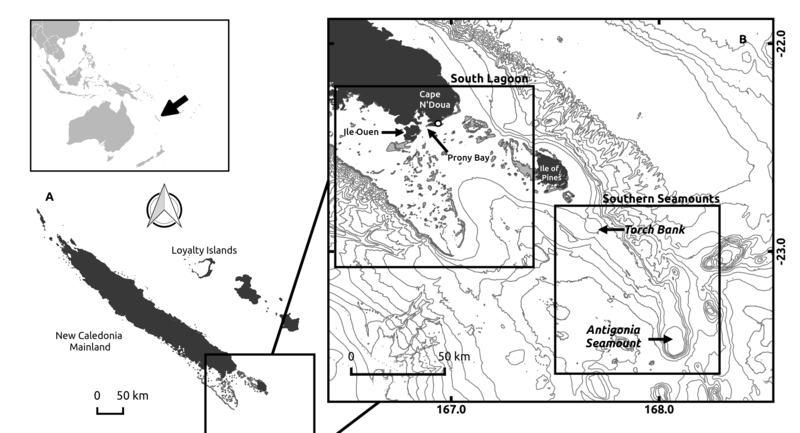 Figure 1: Map of New Caledonia and our study areas: the South Lagoon and the “Southern Seamounts”. Light grey lines represent 200m isobaths. Land is shown in black and reefs in grey. 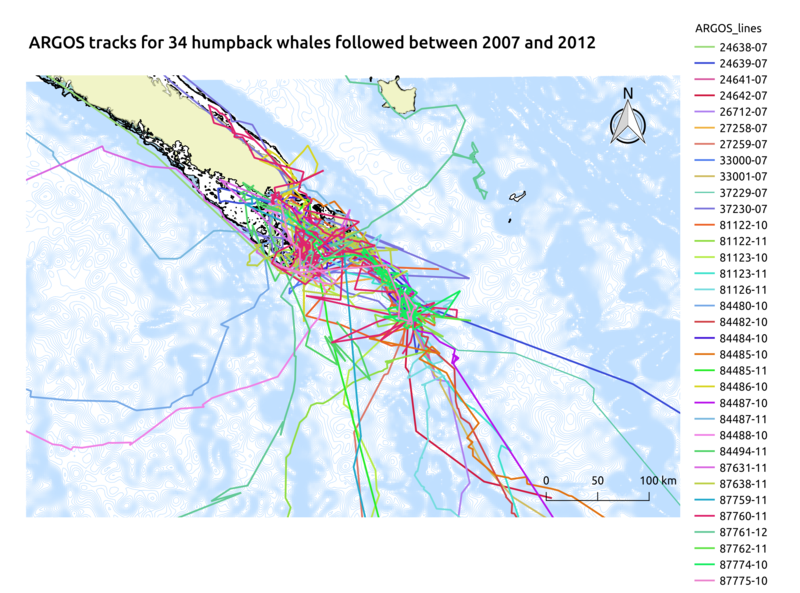 Figure 2: ARGOS tracking of 34 humpback whales tagged between 2007 and 2012 in the South Lagoon. The Antigonia seamount and Torch Bank are completely covered by tracklines. Seamounts are defined as “undersea mountains rising at least 100m from the ocean seafloor” (Staudigel et al. 2010). Most of them have a volcanic origin and the majority of them are located in the Pacific Ocean (Wessel 2001). But what is the link between these structures and marine life? The physical and biological mechanisms by which seamounts attract marine wildlife are diverse (for a review see: Pitcher et al. 2008)⁠. In a nutshell, topography of the ocean floor influences water circulation and isolated seabed features such as seamounts affect vertical mixing and create turbulences, consequently resulting in higher productivity. For instance, have you ever heard of internal waves? Contrary to the surface waves people play in at the beach, internal waves propagate in three dimensions within the water column and can reach heights superior to a 100m! When these waves encounter steep topography, they break, similar to what a “normal” wave would do when reaching shore. This creates complex turbulence, which in turn may attract megafauna such as cetaceans (see com. by Hans van Haren). The importance of seamounts for cetaceans is often referenced in the literature, however, few studies have tried to quantify this preference (one of which was recently published by our labmate Courtney Hann, see Hann et al. 2016 for details). So what importance do these seamounts serve for humpback whales in New Caledonia? Are they breeding grounds, do they serve as a navigation cue, a resting area, or even a foraging spot (the latter being the less likely hypothesis given that humpback whales have never been observed feeding in tropical waters)? To answer this question, an expedition to Antigonia was organized in 2008 and about 40 groups of whales were observed in only 7 days! The density of this aggregation, the high occurrence of groups with calves and the consistent singing of males suggested that this area may be associated with breeding or calving behavior. Several other missions followed, confirming the importance of this offshore habitat for humpbacks. Looking through all this data I was struck by two things: 1) whales were densely aggregated on top of these seamounts but were rarely found in the surrounding area (Fig. 3), and 2) other seamounts with similar characteristics are only a few kilometers from Antigonia, but seem to be rarely visited by tagged whales. What is so special about these seamounts? Why would energetically depleted females with calves choose to aggregate in these off-shore, densely occupied and unsheltered waters? Figure 3: 3D surface plot of the seabed in the Southern Seamounts area. Humpback whale groups observed during the boat-based surveys (2001-2011) are projected at the surface of the seabed: blue points represent groups without calf and white points represent groups with calf. Antigonia and Torch Bank have a clear flat-top shaped and are called “guyots” seamounts. Most whale groups aggregated on top of these guyots. For 3D interactive plot: click here. I will spend the next two months at the GEMM lab in Newport, OR, trying to answer these questions using ocean models developed by New Caledonian local research teams (at IRD and Ifremer). I will be comparing maps of local currents and topography of several seabed features located south of the New Caledonia main island. The oceanographic model used for this study will allow me to analyze a great number of environmental variables (temperature, salinity, vertical mixing, vorticity etc.) through the water column (one layer every 10m, from 0 to 500m deep) and at a very fine spatio-temporal scale (1km and 1day, even 1 hour at specific discrete locations) to better understand humpback whale habitat preferences. Figure 4: Modeled Sea Surface Temperature for July 15th 2013 (model in progress, based on MARS3D, development by Romain Le Gendre). A temperature front occurs in the middle of the study area, along the Norfolk ridge. 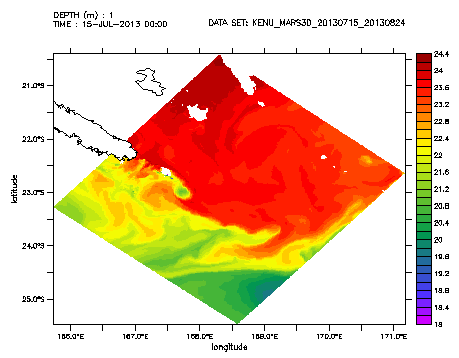 On this image, a cold eddy is forming right on top of the Antigonia seamount. Looking forward to uncovering the mysteries of seamounts and sharing the results in December! Pitcher TJ, Morato T, Hart PJ, Clark MR, Haggan N, Santos RS (2008) Seamounts: ecology, fisheries & conservation. Oxford, UK: Blackwell Publishing Ltd.
Staudigel H, Koppers AP, Lavelle JW, Pitcer TJ, Shank TM (2010) Defining the word ‘seamount’. Oceanography 23,20–21.